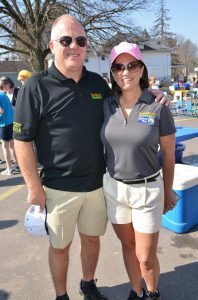 John and Tina founded Sundance Vacations in the early 90s and have been helping organizations in need for decades. 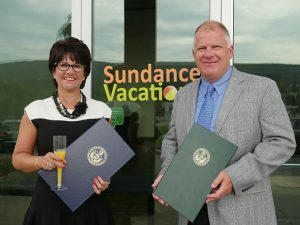 “Sundance Vacations offers us a way to give back to the community. Charity is defined as, “voluntarily giving help to those in need.” Not only does it present a tremendous chance for us to enrich the lives of others and the community, but it also fills us with overwhelming joy to see the positive effects it can have on someone’s life. From a young age, we both experienced the ups and downs of life and now fully understand how important it is to give something back. We spend so much of our waking time at work and because of that it is important to us to build a culture that reflects the values we hold. We have found that the stress of work-life can be balanced out when our work day is filled with meaningful opportunities greater than ourselves or our company. We’ve always been philanthropic individuals. Even as a little girl I [Tina] was involved in Girl Scouts and church activities that often supported charitable causes. We’re happy to report that we’ve been able to pass on that same commitment to our children. Our whole family volunteers together for a homeless shelter program called Family Promise that we helped to form in Carbon County. Supporting charities and efforts that we believe in is extremely important to us because we really believe in the adage, “With great blessings comes a great responsibility.” Neither one of us grew up in an affluent household. We were never hungry but I did once have an experience where I was homeless for a few weeks. An accident occurred when my home was being relocated a short distance onto a new foundation. I didn’t fully understand the mechanical problem, but the novice explanation was that something happened causing the electrical wiring to be stretched and possibly broken inside the walls. This led to the house being declared too dangerous to live in. My family camped a lot during our summer vacations so we had a pop-up camper, stoves, coolers, lanterns and a lot of supplies to turn the disaster into a sort of adventure. Family and friends flocked to our aid, in what seemed like an old-fashioned Amish barn raising. My family was lucky that we had a huge support system during the crisis. Looking back, I realize our family built more than a house in those few weeks; we built resolve and character that would last a lifetime. Giving back for us involves more than just the money we are able to give. Volunteering our time at the homeless shelter is some of the most rewarding work we do. It’s an amazing feeling to really know that you have made a direct and measurable impact on the life of someone else. During our time with the homeless guests, we came to realize that our business problems are nothing compared to the problems some families face every day. Both of us also volunteer our time and expertise on several charity boards. John serves on the Greater Wilkes-Barre Chamber of Commerce, as the chair of the grants committee for the Luzerne Foundation and the Parent Advisor for the Youth Advisory Committee. He also serves on the board of trustees for Wyoming Seminary where he lends his marketing and business expertise. I have served on the Board of the Northeastern Pennsylvania Better Business Bureau before it merged with another larger bureau several years ago. Currently, my efforts are focused on the Family Promise homeless shelter program and the Domestic Violence Service Center. Our ultimate goal is to create a community foundation in Carbon County for years to come. With a few other blessed donors, we hope to instill the idea that giving back is an essential part of life. We’re amazed by the compassion of the several hundred employees at Sundance Vacations. If we had even the smallest part in leading our staff to be more focused on the needs around us, then we have led a blessed life.